If you remember from my post about the 439, the bus driver of that route said that the 441 and 442 are the most scenic buses on the MBTA (and that's saying something considering the views from the 439). My father and I decided to try out the route to see if the driver was right, and we noticed one advantage over the 439 instantly: the schedule. The 441 and 442 are coordinated (the routes are very similar), running every 15 minutes rush hour and every half hour during the day, Saturdays, and Sundays. 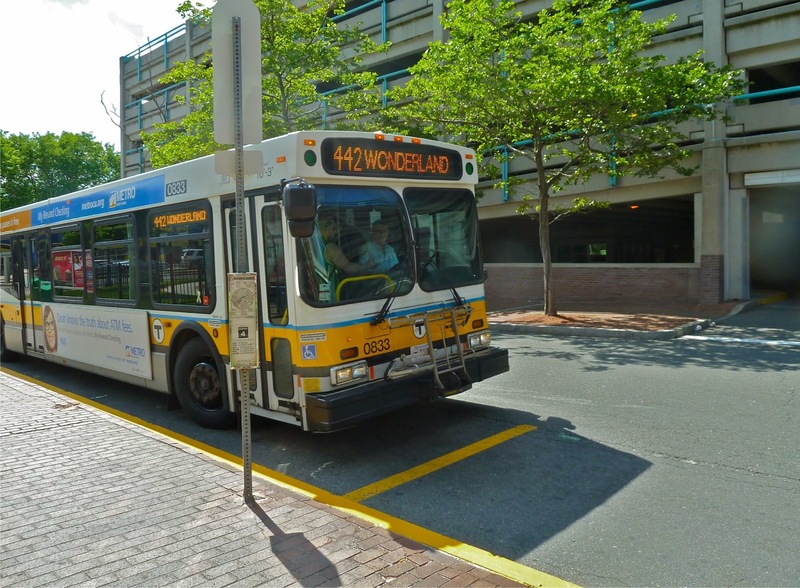 Late night and early morning service runs are all 442 trips via Humphrey Street. There are also rush hour only express variants of the two routes, the 448 and 449. They follow the same route as the 459, serving the World Trade Center and Logan Airport, and then following the 441 and 442 up to Marblehead. That's for another post, though. My father and I decided to completely wing it, so we just rode up to Wonderland to take whichever bus came. We figured we'd take the other route going back. 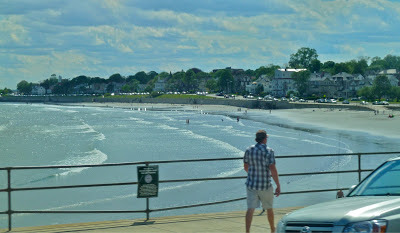 Looking at the schedule, we had about a 20 minute wait, so we decided to make a jaunt to Revere Beach. It was crowded there as we lay down in the sand. I checked the schedule again just to be sure. "Oops," I said. "What?" asked my father. "The bus is leaving five minutes from now," I replied. Turns out I had looked at the wrong column in the schedule, so we quickly ran back up to the station. As we were sprinting up the ramp, my father was saying that I was at the top of his list of annoying people who misread bus schedules. It didn't even matter, though, because the bus was a half hour late! It was a 441, and I was surprised when about 50 people got on the bus. It was standing room only as we left Wonderland and turned onto North Shore Road. The bus pulled off at Point of Pines where no one got on or off, and then went over the bridge I talked about in my 439 post. At the first stop after the bridge, about half the people on the bus got off to visit some big flea market. I guess that explains the unusually high ridership. I've noticed that on the routes on North Shore Road/Lynnway, everyone just seems to use the bus to get to Lynn. That definitely seemed to happen here, and on the 439. There were also a few people who got on at the flea market, but they were taking some time to pay their fares. Apparently someone else noticed, because he shouted out, "Come on! Just pay your fares and get on the bus!" However, this guy was later talking loudly on his phone about the drugs he was taking, so... yeah. Downtown Lynn was a major stop, as one would expect. The bus then turned onto Broad Street, which became Lewis Street. 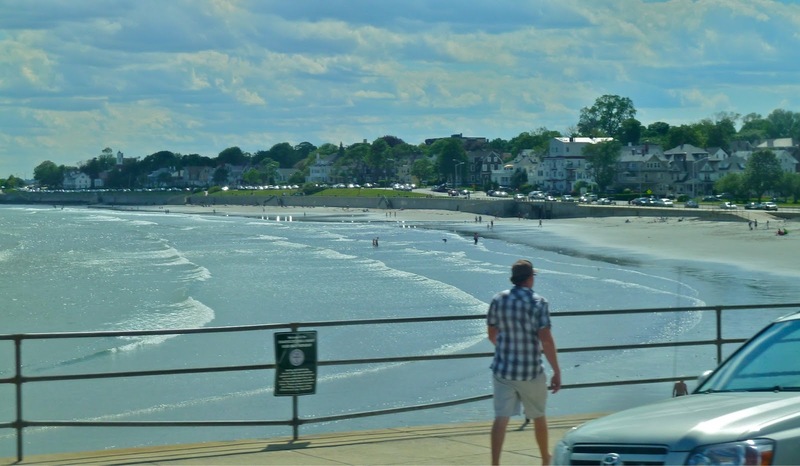 Once Lewis Street becomes Ocean Street and the bus enters Swampscott, the two routes split. 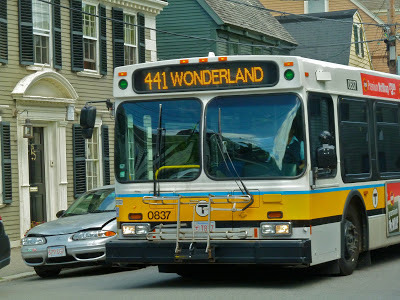 The 442/449 goes onto Humphrey Street by the water, while the 441/448 turns onto New Ocean Avenue, which becomes Paradise Road. Our bus traveled on the Paradise Road route, which was a residential area with the occasional business. The bus then hits Vinnin Square, where there are some businesses and a mall, as well as a connection between the 455 and 459 to Salem. However, only a couple people got off here. The bus then makes a sharp turn onto Salem Street and heads back towards the shore. It travels through a large golf course, and then meets up with Humphrey Street and the 442. There is a nice residential neighborhood, and then some business at "Beach Bluff." Things are mostly residential from here until the bus reaches a major junction with Lafayette Street, and the two join as Pleasant Street. There are lots of businesses now as the bus approaches downtown Marblehead. 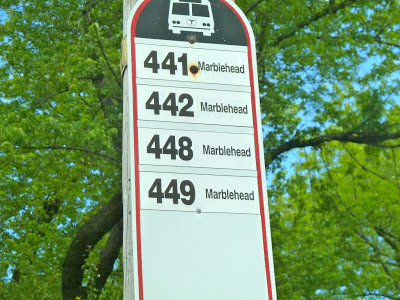 There is a fork in the road, where the bus stays on Pleasant Street going towards the Marblehead terminus while Wonderland-bound buses go onto Elm Street. I absolutely love this picture of the 441 in Marblehead. The two sides merge again at Washington Street, and then turn onto Franklin Street. The roads by now are tiny, and they probably make this a hard route to run. 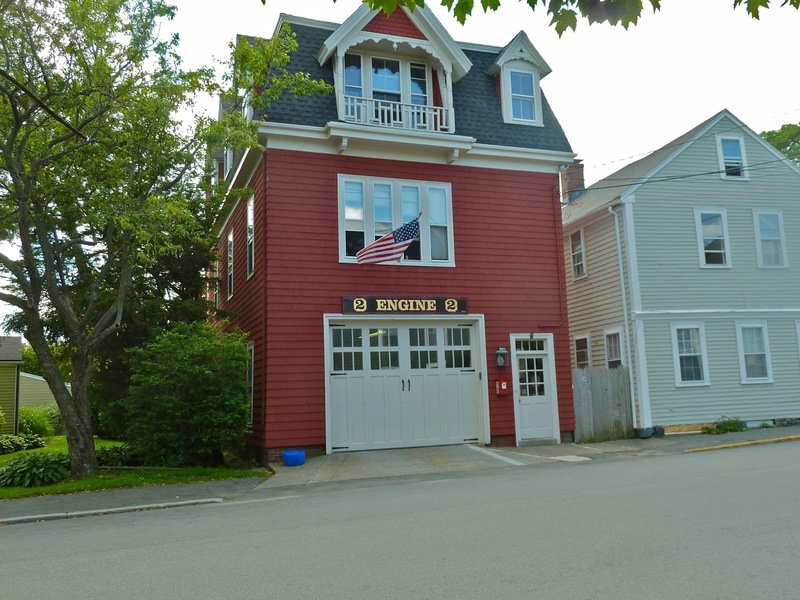 The bus ends right outside of the Marblehead Fire House, a cute little fire station that actually looks like a house. From here, my father and I waited for a 442 back to Wonderland. As the previous bus was a half hour late, our wait wasn't that long. It was very pleasant, though: the bus ends in a nice, quiet neighborhood. There was an open house there, and everyone who passed us said hello. It was really quite pleasant, although the town will be packed come summer due to its coastal location and beaches. The 442 came, although it was five minutes late. I attempted to get on, but I was shooed off by the driver. He closed the doors, and we could hear him yelling at someone on the bus for some reason. He then let us on, and we were the only ones besides the person who got yelled at. Leaving the Fire House, the bus makes a tight loop on Selman and Front Streets. Even though it only takes about 15 seconds, it's actually quite beautiful, as the bus passes right by the water, as well as a cute little restaurant called Barnacle that looked pretty good. The bus passed through all of the places mentioned already, until it reached Salem Street. At this point, the 441 would go toward Vinnin Square, while our bus traveled right by the beach. Although it wasn't as amazing as the 439 view, it was still amazing. You could see the waves, the sand, and you could just make out Boston way in the distance. There were also some houses, a few businesses, and a baseball field. My father had some really terrible Chinese food so he could use the customers-only bathroom. The 431 ended up being over 15 minutes late. Because it was so late, the driver couldn't make the loop back to Lynn because she would miss her break if she did. We decided not to take the risk on a one-way bus that only runs every two hours. Instead, we decided to take a bus back to Wonderland. That bus ended up being the 426, which was (you guessed it!) late. It was a nice ride (review coming at some point), and we finally made it back to Wonderland to take the train home. Ridership: When I rode it, most of the people were going to the flea market. The rest were just residents of Lynn and Marblehead (nobody really got on or off in Swampscott). During rush hour, this is probably a commuter-heavy bus, as there is no Commuter Rail service to Marblehead. I've seen some very large crowds getting into the bus at Wonderland. I was surprised with the number of people that went all the way to the end on the 441; there were about five people who got off there. Some people besides us actually took this bus from beginning to end. Pros: Although the views aren't as great as the 439, the schedule gives this bus an advantage: people can actually take it. 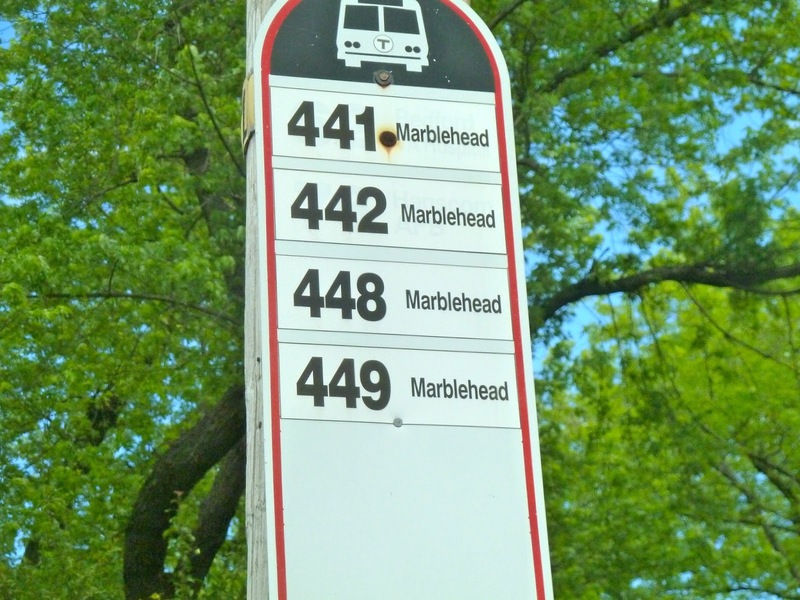 I recommend the 442 by the beach, but I loved going through downtown Marblehead. It has a nice, village feel to it. These buses are also the only public transit option in Marblehead, which is probably why they run so often (for a suburban bus, that is). Cons: A half hour late? Are you kidding me? If this was because of traffic on a Sunday, then I'd hate to ride this bus during rush hour. If buses are always this late, then the route must experience bunching, which is never good. Nearby and Noteworthy: Besides the Barnacle restaurant, there are a lot of small little shops and stores in Marblehead. However, there is also the Marblehead Rail Trail, a beautiful trail that starts in Marblehead and branches off to Swampscott and Salem. Although I haven't tried it for myself, the pictures look beautiful and it looks like a nice walk. The bus goes quite close to the trailhead, too. Let me just say one thing: this bus is not more scenic than the 439. However, a bus that runs every half-hour on Sundays is much better than a bus that runs five times a day, weekdays only. This route seems like the sort of route to experience bunching, based on the experience I had with it, and the streets in Marblehead are so tiny, it must be impossible to pass another bus. It's a great route otherwise. Latest MBTA News: Countdown clocks have been rolled out on the entire Red, Blue, and Orange Lines except for Charles/MGH and Orient Heights according to this article. There are shuttle buses replacing the Orange Line from Ruggles to Forest Hills this weekend (June 15-16). Also, on June 15, 18, and 20, shuttle buses are replacing the Orange Line from Sullivan to Oak Grove from 9 PM to the end of service. I'm a regular commuter on the 441 between home in Swampscott and work in Marblehead when bike weather is not so good, with 442 as a backup. Mid-weekday service is pretty regular; lateness is not an issue. When the 441 arrives at the firehouse, it typically has a 15 minute layover before it leaves for Wonderland as the 442 (and vice versa). The section of the route in Revere is very susceptible to major traffic delays on any day and time - typically caused by rush hour and the nearby beaches. It's not likely to get better; there's major development proposed on the route in Lynn. Transit geek notes: These routes used to originate in Haymarket; first the Haymarket leg was dropped on weekends and then everyday. The connection at Vinnin Sq to the 459 is poor, the 441's stops are a substantial distance from the street you'd use to get to the 459. The connection is better at Burrill St. (train station), but that's not an "official" connection. Lafayette St in Marblehead used to host the Salem - Marblehead route. According to old maps, back in the trolley days, most of the route in Marblehead Old Town was single track, so the narrow streets weren't such an issue. The rail trail extension is on the ballot for June 29, 2017. I'm not sure how it would cross the 441 (Paradise Rd) because there's a substantial grade separation there, and bridges are expensive even when the old abutments can be re-used.